Letty Valdez Mysteries are available as trade paperback or ebook from Amazon, Apple iBooks, Barnes & Noble, Kobo, Overdrive, Smashwords, Ingram-iPage, and Rope's End Publishing. Tucson private investigator and Iraq War vet Letty Valdez joins forces with an unlikely ally, Chinese police Detective Inspector Zhou LiangWei, who has been sent to Arizona on the advice of Interpol to track the activities of Hong Kong triad gangsters. In this fast-paced suspense thriller, Letty and Zhou work together to stop the murderous triad criminals, and at the same time, find and rescue three abducted young women. Mystery + suspense + a touch of romance = a page-turner set in the Sonoran Desert! Just announced: Desert Jade is a finalist in the Thriller-Suspense category for a New Mexico-Arizona Book Award, 2018. Winners will be revealed in mid-November. A murder in the library leads Tucson private investigator Letty Valdez and her librarian friend Seri Durand to a lost memoir which recounts the story of a love affair between two immigrants, one Chinese and the other Italian, in late 19th-century Arizona Territory. The memoir provides clues for Letty when she takes on the job of tracking down the killer. Almost immediately she finds herself to be next target! 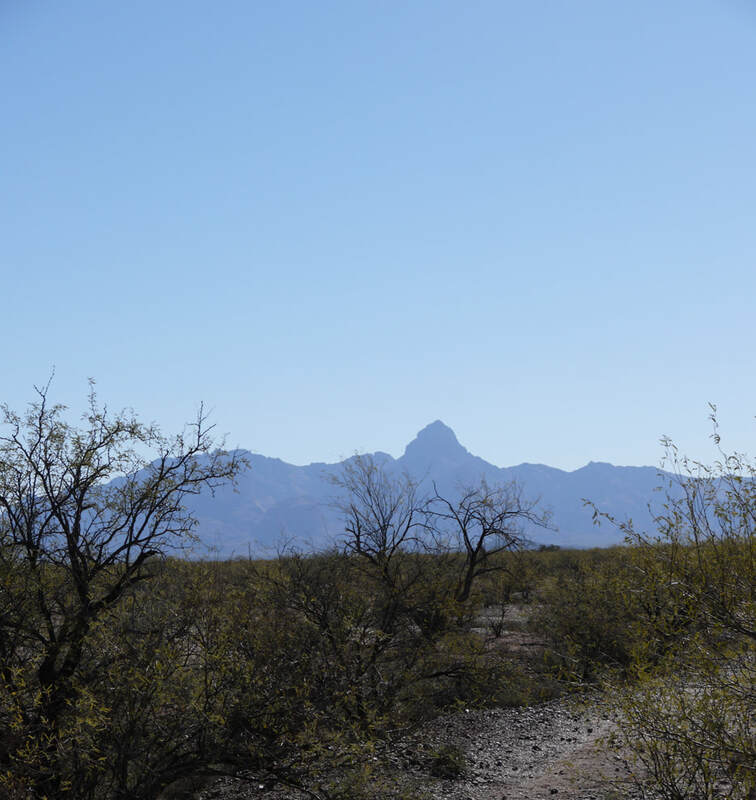 Mystery + suspense + maybe the promise of romance = a page turner in the Sonoran Desert. In the next Letty Valdez mystery, Dragon’s Revenge (available now! ), Millie gets a friend. His name is Teddy. Here Letty tells Will and his girlfriend about their opportunity to adopt Teddy. “Remember that dog trainer from El Paso, Jack Gilliam, who used to be Millie’s original owner?” Will and Clarice nodded. Letty had been hoping for some time to take a dog along with her on her morning runs. Millie the pit bull had never been able to run with Letty. Millie, her name was short for “milagro” – the Spanish word for “miracle,” had an almost-useless front leg. 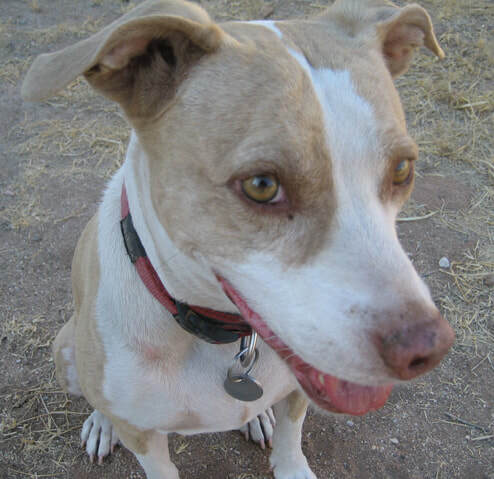 Millie had been stolen from Jack Gilliam’s home, brought to southern Arizona and used as bait in a dog-fighting ring. The tendons and ligaments of the small female pit bull’s front leg had been severely damaged. When she was too injured to be used as bait anymore, the dog had been dumped out in the desert to die slowly in the hot sun. Letty had found and rescued Millie. After a stint at the vet’s, Millie came home to live with Letty and Will. “So if this dog is trained as a sniffer rescue dog, why does Gilliam want us to take him?” Will asked. He had a perplexed look on his face. Clarice elbowed Will in the ribs. She grinned, too. “What’s the dog’s name?” Clarice asked. “I’m not even going to ask,” Clarice giggled. “Especially friendly to the girls,” Will broke in, a big grin still on his face. “Millie will like him,” Clarice said. “And Teddy’s going to like Millie for sure. She’s definitely a girl!” Will added. ​My name is Sunday. I'm a rescue from the animal shelter in Tucson. That means I'm a real dog. I was adopted on a Sunday. That's how I got my name. Millie the rescue pit bull in Letty Valdez Mysteries looks like me! We could be sisters. I like to take long walks and I like dog treats. I don't read books although I don't mind at all if you read to me. where Letty spent her childhood and where her siblings Eduardo, Elena and Will grew up. Here you see Baboquivari Mountain.